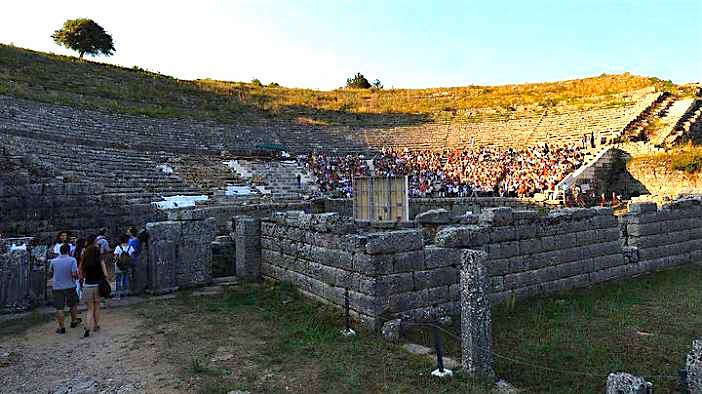 The 1st Festival of Ancient Greek Theatre in Epirus opened at the ancient Dodoni theatre on Saturday night with a performance of the Euripides tragedy ‘Medea’. The evening started with a message from Prime Minister Alexis Tsipras, read by Administrative Reconstruction Minister Olga Gerovasili. “Our culture and all we have to show, as well as all that we have still to create in the present, are the country’s great strength and one of our comparative advantages,” the minister said. The work of economic growth and cultural development, the much-needed reorganisation of production and society, are things that “go together,” she noted, while welcoming the new festival as a “great step”. “Today three historic organisations are working together. The Art Theatre with the Ioannina Municipal Regional Theatre and the Athens and Epidaurus Festival. The union of forces can give a new momentum to culture. It can eject ancient drama and culture beyond the narrow boundaries of a single body. And this is important, it is why I came to watch this performance here and not in Epidaurus. To highlight exactly this historic event,” she said.